Fashion is trolling the masses. 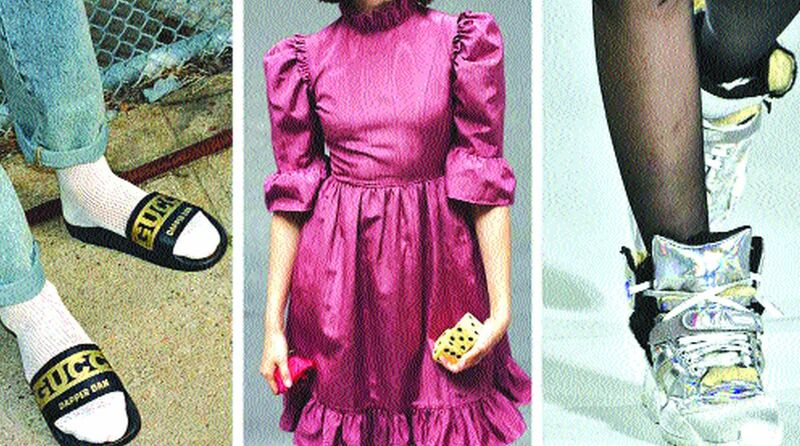 In recent seasons, against all the rules of contemporary taste, it has asserted that once-derided styles such as crocs, prairie dresses and chunky orthopedic sneakers are now desirable. And here’s the thing: all this dowdy, arguably ugly fashion? Consumers are going to buy it – because it’s comfortable, familiar and, occasionally, practical. Discerning eyes will adjust to the aesthetics; they always do. It takes time and patience, but now shredded jeans look normal and so do oversize silhouettes. A high-necked, ruffled dress fit for Laura Ingalls Wilder? The gateway to ugly – an adjective used here with affection – was the Birkenstock. Known for its inelegantly moulded footbed and its crunchy-granola history, the classic German sandal was reimagined in a hyper-luxurious. The fancy new version was comfortable and wearable. The fashionable Birkenstock is an exemplar of the rise of anti-fashion, says Sara Maggioni, the director of retail and buying for London-based trend forecaster WGSN. The same cannot necessarily be said for clunky Forrest Gump trainers, rubber Crocs or long, flowing Dust Bowl dresses. The giant trainers, which have been advocated by brands such as Balenciaga and Maison Margiela, are an assemblage of suede, leather and mesh, often in a collage of clashing colours. The soles, platforms stacked atop platforms are like a parfait of moulded rubber. The prairie dress, equally jarring to the eye, was interpreted in multiple variations by Raf Simons for Calvin Klein for autumn 2018. One version of the ankle-length style comes with pin-tucking and a wide, ruffle-trimmed collar. Only its deep V-neck prevents it from looking Amish. The brand Batsheva is fully committed to the prairie: Laura Ashley meets Gunne Sax meets grunge. Its floral cotton dresses have puffed shoulders and a ruffled Peter Pan collar. Some have ruffle-trimmed patch pockets. They are sometimes paired with coordinating bonnets for maximum fashion effect. Wearing these styles with aplomb is like executing the triple axel of fashion: high level of difficulty, significant risk of failure, tremendous bragging rights if accomplished. The thing you most certainly wouldn’t wear these dresses with is a pair of prissy heels. Fashion has cosied up to the ugly aesthetic in the past, most notable in the late 1990s when Prada rose to prominence with its eyesore prints and murky colours. But this go-round may best be traced back to normcore, that short-lived anti-fashion uprising that found its way into trend reports, promoting unremarkable clothing as hip. Throw in a bit of dad style. Mix in a rising revulsion with Instagram faux-perfection. Add a dash of fashion hate from the masses. And tip your hat to brands such as Vetements, Balenciaga, Y/Project, Gucci and a host of others that championed unorthodox beauty and gender fluidity. These anti-fashion looks were also born out of the collective ennui of fashion insiders searching for something more authentic. These products exude unpretentious, sexless populism. All of this is a reminder that the fashion industry has stopped dictating fashion. The elites have ceded control to the hoi polloi. And this is what your next door neighbours have come up with. In other words, consumers are responsible for these waves of ugly. We the people are trolling ourselves. But this doesn’t necessarily mean the great unwashed have somehow sapped fashion of its power to hypnotise and woo. But it takes a certain inner confidence to walk into a fancy gathering wearing a pair of 10-buck, no-name shower shoes. Eventually, inevitably, the fashion pendulum will swing. The jarring, quirky ensembles will begin to look a little dated. A more refined and polished facade will suddenly look fresh. Or maybe hyper-femininity and masculinity will float to the top. Until then, marvel at the quirky trend, which today is sometimes worn but can still conjure up images of sun-baked tourists waddling across the National Mall. Ugly fashion is, if nothing else, practical.